Meet Jimmy Sandoval, Cosmetology student at La’ James International College in Fort Dodge! Jimmy shares some of his favorite LJIC moments for today’s #LjicTuesTimonial! 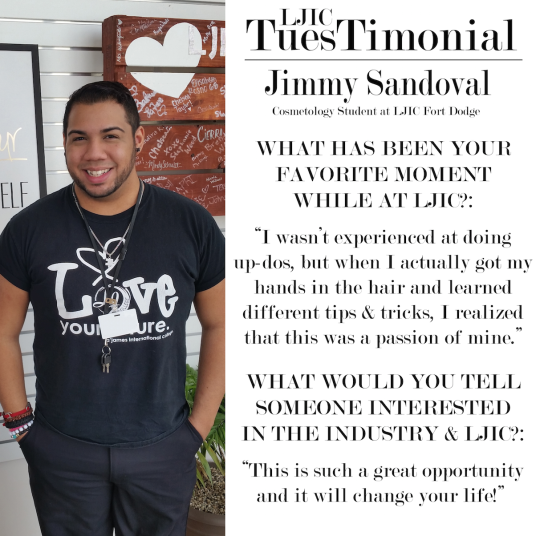 Thank you Jimmy for sharing your LJIC experiences & for participating in today’s TuesTimonial! Are you ready to learn more about La’ James International College & the programs offered? Contact a Career Planner today! Call 888.880.2108 or visit www.LJIC.edu.